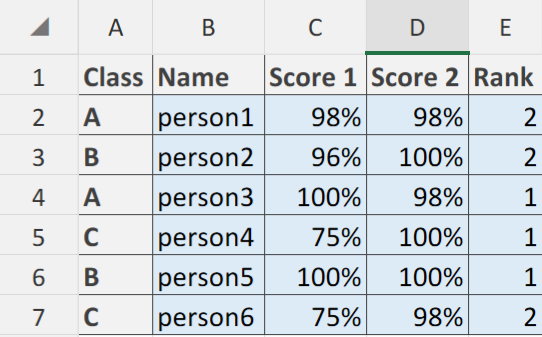 1- If Score2 is highest in the class and there is no duplicate value then it will be ranked as 1. 2- If Score2 is highest in the class and there is duplicate value then the record with highest Score1 should be ranked as 1. See the picture for more understanding. 2- Forget to mention formula should continue rank 1,2,3,4... if there is more values in the data-set. It would be helpful, if you can provide sample data with expected result. I hope the idea is clear. Thank you very much for the help. both solutions are awesome.